Attention Jeepers – There’s a New Trail in California! Special to ModernJeeper from Jeff Blewett, Natural Resource Consultant to the California 4Wheel Drive Association. Re-Routing the Slick Rock Trail of California. Clubs ban together to save the famous Slick Rock Trail of Northern California. Here’s the story. The Slick Rock re-route project is located on the Stanislaus National Forest in the Lake Alpine Recreation Area, East-Southeast of Lake Alpine in Alpine County. The purpose of this project was to reroute about 0.75 miles of the Slick Rock road (7N17) that is currently located on private land to maintain 4WD access between Lake Alpine and Utica Reservoir. Without the re-route, the trail would have been closed! The road has existed for over 100 years between Lake Alpine and Utica Reservoir. The road provides year-round opportunities for operating 4WD highway legal vehicles and dispersed camping. A 0.75-mile portion of the Slick Rock Jeep Road; however, traverses a private parcel despite no formal right-of-way authorizing public or administrative use ever being granted to the Forest Service. The private parcel affected, was sold in 2015 resulting in a change of ownership. Right away access had not been granted by the land owner. The new land owners requested that the Forest Service reroute the road to lands outside of their private land. The land owner agreed to allow public use of the road located on their land through calendar year 2018 while some sort of re-route was constructed. Shovels and strong backs help save trails! The Joaquin Jeepers have been the adopt-a-trail club for the Slick Rock trail since the early 1960’s. The club has maintained an active role in keeping the Slick Rock open each year with many trail projects and trail clean up’s. This was no different. The first thing we had to do was to get the USDA Forest Service, Calaveras Ranger District on board with the reroute project. After many calls and preliminary meetings, we waited for the the snow to melt so we could walk the proposed reroute with the Forest Service. During those hours of walks we found a few good rock formations that would add a challenge to the new reroute. After about a month of walking and marking the proposed reroute it was time for the Forest Service to bring in the all the biologists, hydrologists, archaeologists etc. to take a look at the proposed reroute. After the Forest Service had all of their specialists come in and look at the proposed reroute, we had to wait and see if anyone of them found something that would stop the project or make us reroute the reroute. This seemed to take forever, but about a month later we got the word that the reroute project was a go and the project had been signed off by the District Ranger. In June the USFS came in and cut down trees and used a small trail tractor to cut in the trail to get us started. Then, for the next two weekends the Joaquin Jeepers organized volunteer work days to come in and help clear the trail of downed trees and brush. On the final weekend we continued to move downed trees and move rocks to help delineate the trail. 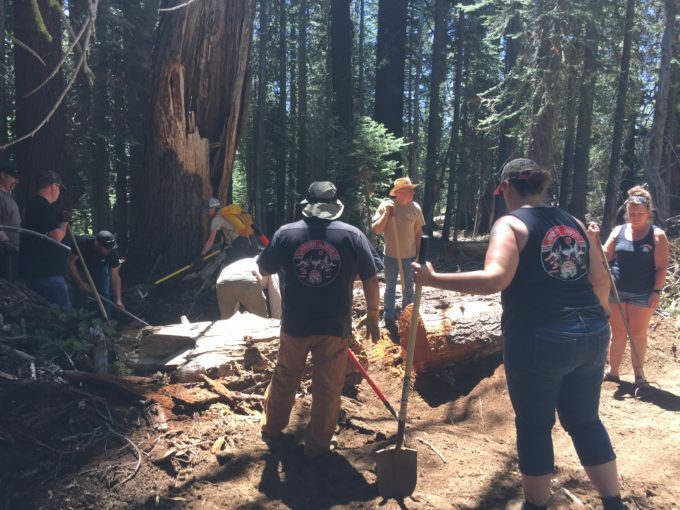 Each of the work party’s had 30-40 volunteers, they were individuals and club members from the Joaquin Jeepers, 4×4 In Motion, Railtown 4 Off Road Club, Motherload Rockcrawlers, South County Trail Riders, OutKast Jeepers, NorCal 4 Wheelers and many more. It was an amazing effort of combining forces for the greater good! On August 4th, 2018 the USDA Forest Service held a Grand Opening ceremony which was attended by over 50 people. In attendance were members of the Forest Service, County Supervisors, Law Enforcement Officers, ModernJeeper, C4WDA and many members of our off-road community. The new reroute section was opened to the public and many had their first change to run the trail that day. The Joaquin Jeepers set up a staging/parking area, rounded up the goodies, and provided lunch for all the volunteers on each of the work days and the Grand Opening Ceremony. Smiles were abundant. Not often do you get to open a new section of trail these days and we are very grateful to all the volunteers who came out and donated their time to our project. 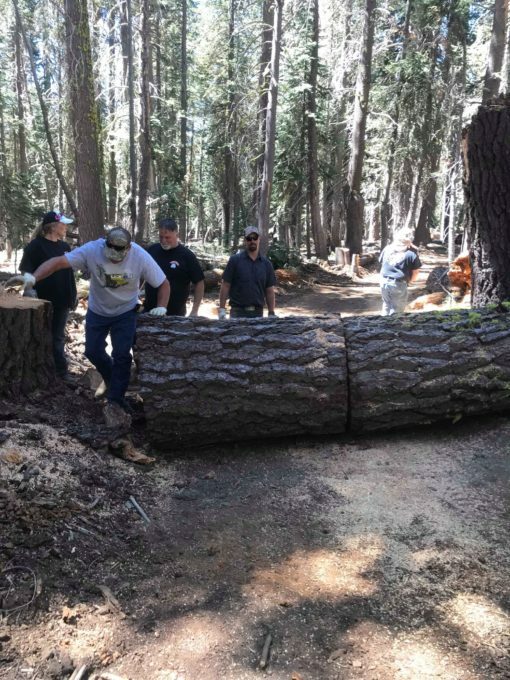 We also want to single-out and thank Jeff Hilson (USFS) of the Calaveras Ranger District and his staff for all the time and effort they put into this project. You rock! So, the next time you go out on the Slick Rock Trail, just remember how much work went into the new reroute section and please tread lightly. Thank you to all the volunteers, and especially you Jeff Blewett. You spent a lot of your time in meetings to make this happen! We need to get the State Parks Department in Contact with those folks so we can get the Nightmare Gulch Trail re-opened in the Red Rock State Park. Awesome! Hearty congratulations to everyone involved. That’s awesome to see ya’ll coming together to make this possible! Great work , awesome to see Slick Rock and Strawberry reopened, and Deer Valley. Thanks to all of the club members and volunteers out there getting this done.